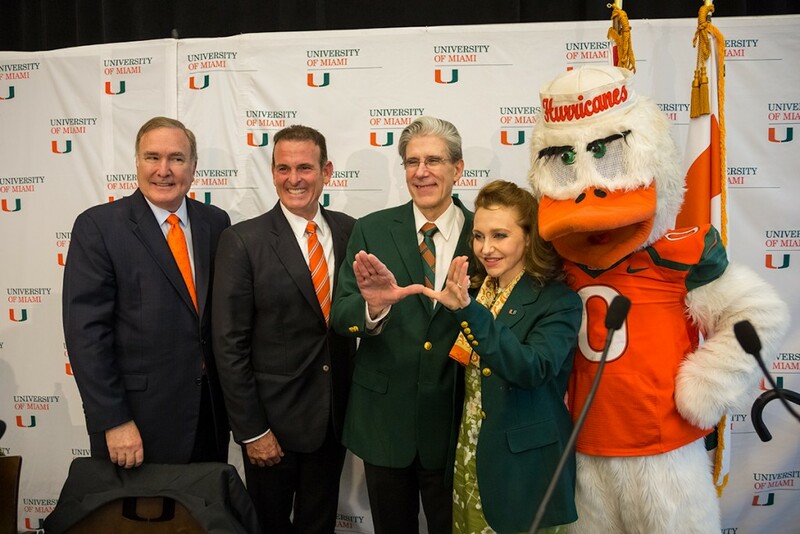 UPDATE: This story was updated on Wednesday, April 15 at 8:25 p.m.
Dr. Julio Frenk was confirmed as the University of Miami’s sixth president and first Hispanic president on Monday. Soon after the press conference, the current dean of faculty at the Harvard School of Public Health was given a Hurricanes welcome by the UM band, dancers dressed in orange and green, and of course, Sebastian the Ibis. But this was not his first time visiting the ibis-covered campus. In fact, Frenk came to the Gables campus as part his medical school training in the mid-1970s. “I have fond memories of that encounter,” Frenk told The Miami Hurricane. 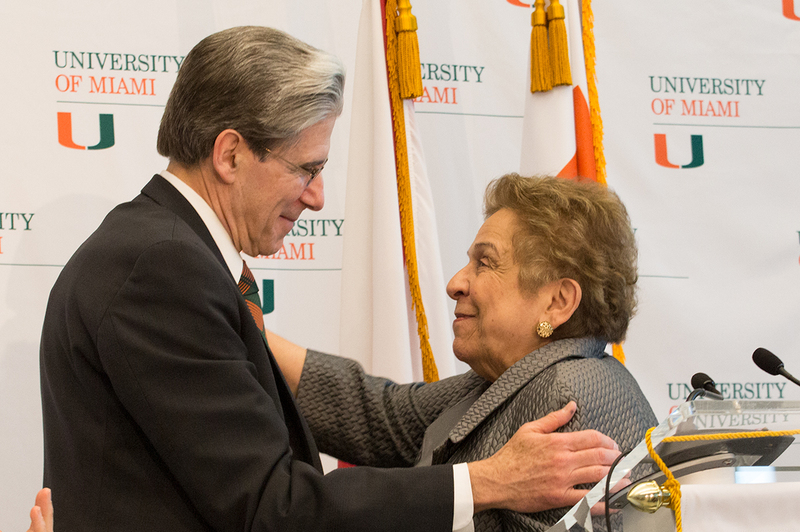 Frenk will replace Donna E. Shalala, who steps down at the end of the academic year. His term begins Sept. 1, 2015. Following a campus-wide celebration that included free food from food trucks, student leaders from more than 15 organizations had the opportunity to talk shop with Frenk. “He was very open to hearing student concerns and was willing to work with us directly to improve our campus community,” said Brianna Hathaway, Student Government president-elect. Current SG President Alessandria San Roman echoed Hathaway’s sentiments. Daniela Lorenzo, president-elect of the Federation of Cuban Students, also attended the meeting. She was equally excited about Frenk’s wife, Felicia Knaul, who is applying to join UM’s faculty in fall 2015. Knaul is an associate professor at Harvard Medical School and director of the Harvard Global Equity Initiative. “She was so witty and insightful and so personable that I know she’ll be a great faculty member and will enhance the U greatly,” Lorenzo said. The Board of Trustees officially confirmed Frenk’s appointment after a unanimous vote Monday morning. Despite the long list of “outstanding” candidates, which had been narrowed down to four just a few weeks ago, Frenk was the “right person,” Fain added. “We thought we came up with a candidate who had an exceptional record of accomplishment and also had the personality and the drive and the history of success to show he’s the person who gets things done,” Fain said. Frenk joins the university as it begins to wrap up the Momentum 2 fundraising campaign, which has raised $1.6 billion ahead of schedule. 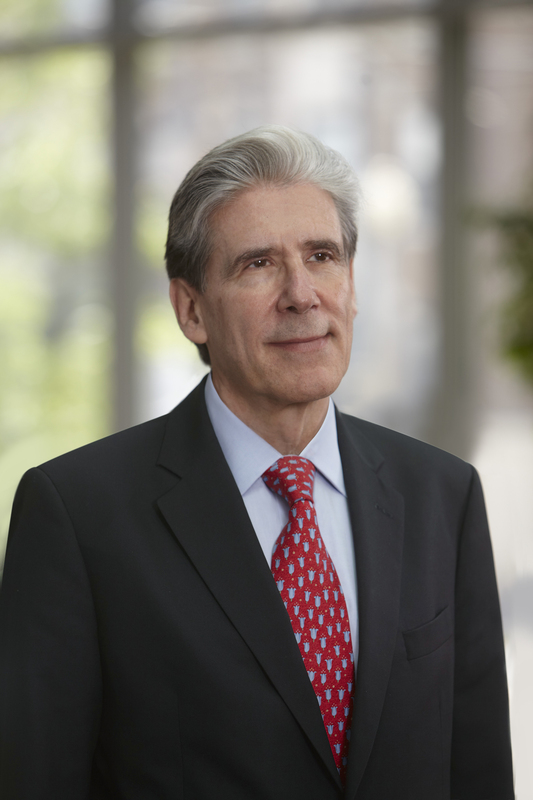 During his six-year tenure as the dean of Harvard’s School of Public Health, Frenk quadrupled fundraising from $26 million in 2010 to $103 million in 2014. He also steered a $350 million naming gift – the largest single gift in Harvard’s 378-year history. “It’s clear from their choice that the University of Miami’s trustees share Julio’s own qualities of wisdom and foresight, and that they have discovered in him the remarkable leadership capacity and vision with which he has graced Harvard these past six years,” said Harvard University President Drew Gilpin Faust in the university’s news release. “I want to learn from UM, what’s important to the community,” he said. 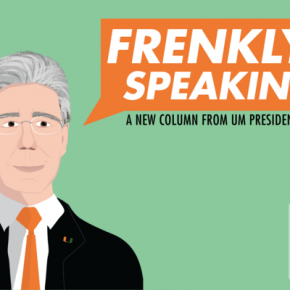 Frenk says he is a “strong believer in diversity.” He wants to ensure that UM promotes a “sense of belonging” for students, faculty and staff. “It’s not only the right thing but the smart thing,” he said. Frenk is the son of German and Spanish immigrants to Mexico. He earned his M.D. from the National Autonomous University of Mexico in 1978 in his hometown of Mexico City. After medical school, he pursued a career in public health rather than a clinical residency. At the University of Michigan, he also earned a Master in Public Health in 1981, a Master of Arts in sociology in 1982, and a joint PhD from the departments of Medical Care Organization and Sociology. Aside from Harvard, Frenk has been a professor of public health at the University of Michigan, the School of Public Health in Mexico, and the National Institute of Public Health in Mexico. Frenk’s administrative roles included executive director for Evidence and Information for Policy at the World Health Organization from 1998 to 2000, and Minister of Health of Mexico from 2000 to 2006. As former Minister of Health, Frenk is best known for introducing a national health insurance program, known as Seguro Popular, which expanded access to health care for tens of millions of previously uninsured Mexicans. 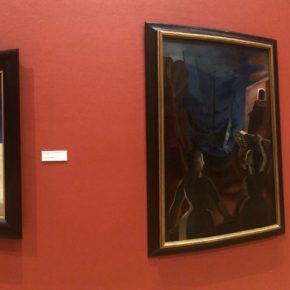 Frenk is also a member of the U.S. Institute of Medicine, American Academy of Arts and Sciences, and National Academy of Medicine of Mexico. Frenk and Knaul will move to Miami with their youngest of two daughters, who is 10 years old. Executive Vice President and Provost Thomas J. LeBlanc will serve as interim president between Shalala stepping down and the beginning of Frenk’s tenure.